Heather Sink was born in northern England. She’s always had a passion for the arts and enjoyed painting still life and landscapes in watercolor growing up. As an adult, she worked and traveled all over Europe taking in the diverse sights and cultures. She earned a Fine Arts and Education Degree from Meredith College in Raleigh, NC. Heather taught art in the North Carolina public schools for many years, as well as Jordan Art Center. 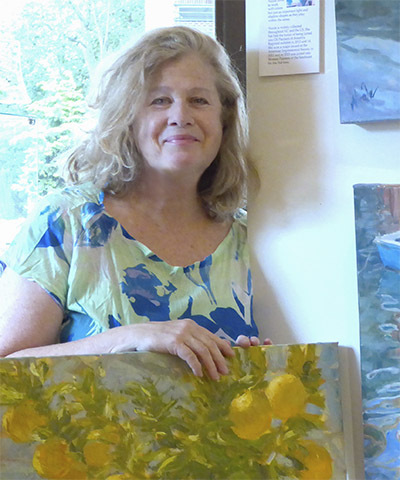 Now, Heather has a gallery/studio in Beaufort, NC, called Craving Art Studio where she paints, teaches classes, and hosts visiting artists workshops. The subjects which draw Heather are mostly vignettes of the coastal area of her beloved Beaufort, North Carolina. Abstract painting and mixed media are avenues she is exploring. She strives for her work to connect with the viewer in a personal way and on an emotional level. Heather is a board member of the Arts Council of Carteret County, an artist member with the Visual Art Exchange and a member of the North Carolina Museum of Art. Contact Heather. Visit Heather's website. Danni Dawson received her B.A. and M.F.A. degrees from George Washington University and apprenticed with Nelson Shanks. 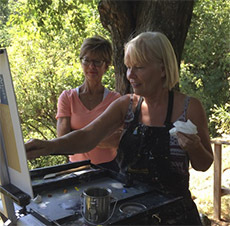 A professional artist and teacher for over 25 years, Danni has exhibited her paintings nationally and internationally, and has received many awards including the Allied Artist Award, the Salmagundi Painting Prize, The Audubon Award and an Award for Painting from The National Academy of Art and Design. Her work has also been featured in American Artist, most recently in the Winter 2007 issue of American Artist Workshop article "Danni Dawson: Helping Still Life Painters Find an Individual Voice." With over 300 portraits to her credit, Danni Dawson has painted heads of state, dignitaries, and university officials as well as senior members of the military and medical communities. Her portraits and still life paintings are displayed in collections throughout the world. Contact Danni and visit Danni's website. Mike Francis studied at the Corcoran School of Art, received his BFA from the Maryland Institute College of Art, and his MFA from George Washington University. Teaching experience includes the Art League School (1978 to present), George Washington University (20 years), George Mason University, Trinity College, Northern Virginia Community College, Prince George’s Community College, and Charles County Community College. In addition, he has taught abroad through the auspices of various institutions in Paris, Brittany, Spain, Greece, Italy, and Ireland. 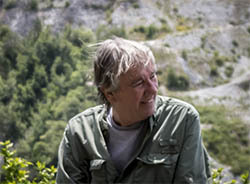 Mike has had twenty solo exhibitions in the last twenty-six years, and participated in hundreds of group efforts. Many of these events were reviewed in various media. He has received several awards, including the Virginia Prize for Painting and the David Lloyd Kresge Award. Adrienne Wyman is an accomplished artist best known for: lifelike portraits, intimate mother and child scenes, and portraying vibrant markets and cultures around the world. Her mother and child paintings have been compared to "a modern Mary Cassatt" and The Washington Post described her portraits as elegant. As a teacher, Adrienne is encouraging, communicates clearly, and has an infectious passion for art history. 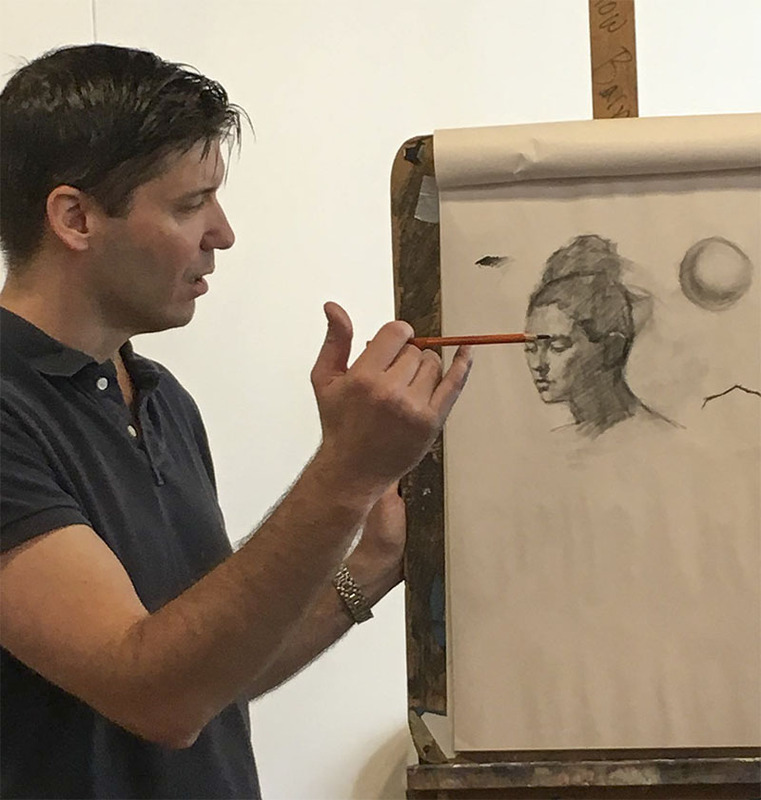 A popular instructor at the Smithsonian Associates in Washington, DC, teaching oil painting classes infused with lessons from art history which combine hands-on painting, lectures, and museum tours. Adrienne also lectures at George Mason University’s Osher Lifelong Learning Institute and Montgomery College, as well as teaching visual arts at Blyth Templeton Academy on Capitol Hill. Adrienne received her B.F.A. in Graphic Design and Art History from Auburn University. She received her World Art History Certification from Smithsonian Associates in winter 2017, and expects to earn her M.A. in Art History from George Mason University in 2020. Contact Adrienne. Visit Adrienne's website. Gavin Glakas grew up in Bethesda, Maryland and started drawing about the time he started walking. He studied with at Washington University in St. Louis and the Slade School of Fine Art in London. After graduation, Glakas spent a year and a half working on Capitol Hill as a Senate staffer. He had planned to go to law school, but after an eight-month illness culminating in the removal of a tumor from his lung at the age of 24, he decided to pursue his lifelong ambition of a career as an artist. Glakas began showing his work in galleries almost immediately and spent five years studying with Danni Dawson and Robert Liberace. He has won numerous honors for his artwork, including awards from the Portrait Society of America and the Butler Institute of American Art. His paintings have been featured on NBC News and in The Washington Post, as well as American Art Collector, In-ternational Artist, The American Scholar, Art Business News, The Strand and Elan magazines, and exhibited at museums and galler-ies throughout the country. Glakas’ paintings hang in the permanent collections of the US Senate, the House of Representatives, the Virginia State Capitol, Georgetown & George Washington Universities, and The Society of the Four Arts Museum in Palm Beach, FL, as well as numerous private collections. He teaches painting and drawing at the Yellow Barn Studio and is represented by Principle Gallery of Alexandria, VA, and Charleston, SC. Contact Gavin. Visit Gavin's website. Nicole White Kennedy is well known for her love of painting Italy, especially al fresco street scenes, beautiful Italian ports, caffés and people in the Italian environment. In 2017 Nicole was awarded Signature Members American Impressionist Society based on many of these works. 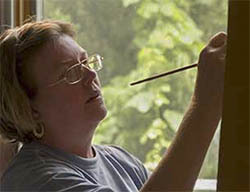 Nicole has been painting and teaching for over 17 years and owns one of the top galleries in Raleigh, NC. Her creative path started as a child, always painting and drawing, she went on to study at Parson’s School of Design and School on Visual Arts, followed by a career as an advertising art director in Manhattan. In 1996 she and her husband moved to Raleigh (to open and Italian restaurant) and Nicole has been painting full time ever since. Nicole has continued her artistic journey studying with many master painters throughout the US. 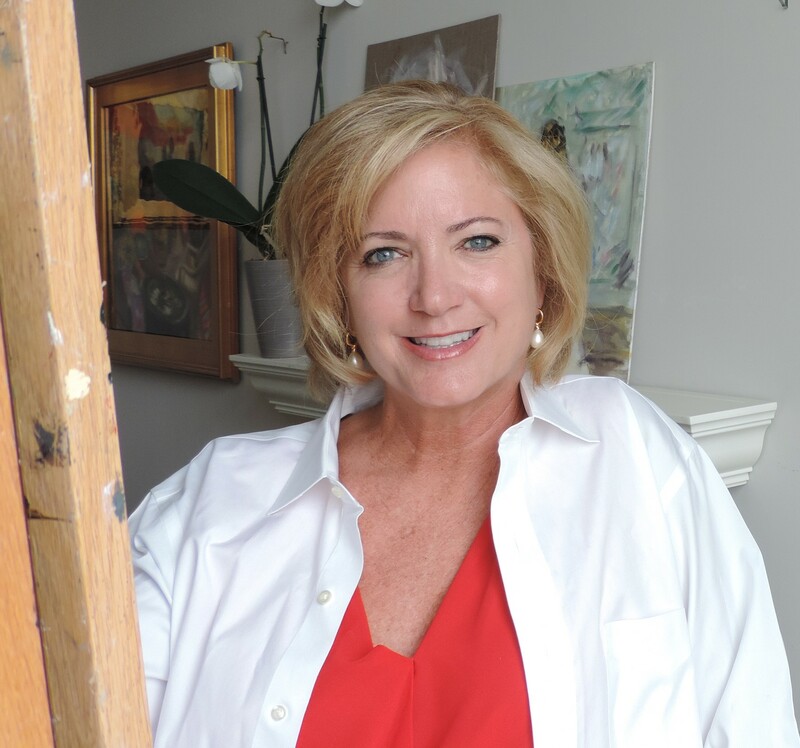 Nicole Kennedy has been in numerous juried exhibits from the American Impressionist Society, Oil Painters of America, National Oil & Acrylic Painters, Women Painters of the Southeast. She was awarded Signature Member of the American Impressionist Society in 2017, one year winning the Southwest Art Magazine Award of Excellence. She won Outstanding Figurative in the annual Woman Painters of the Southeast exhibit and Excellence in Figurative NOAPS online competition. She has won several awards with Audubon National Artists Society exhibit at the Salmagundi Club NYC. Nicole had been published in Fine Arts Connoisseur, American Art Collector, Raleigh News & Observer, Southern Living. In Summer 2018 Nicole was the cover feature and interviewed for Wake Living Magazine, and 2017 for Wrightsville Beach Magazine. Contact Nicole. Visit Nicole's website.